The manor house of Padure Manor has never undergone major rebuilding. Since it has been preserved in its original form to date, with a very large proportion of original details and interior finishes, the building is a unique example of the 19th century 2nd quarter artwork on the Latvian scale. The architectural value of the building is also enhanced by the decoration of the interior decoration of the 2nd half of the 19th century and the beginning of the 20th century. The total area according to the inventory case is 960.7 sq. m. Useful area 838,9 sq. m. The total area of the land is 2.33 ha. Manor house has 3 floors. Initially in the basement in 12 rooms cellar, pantry, living room of washer, roommate room, housewife’s room, servant’s room, housekeeper’s room, garden boy’s room, washing room, kitchen and wine cellar were located. There were 12 rooms in the so-called lord’s or middle floor. The lobby of the building was dark grey with a brown-skinned floor. On the left side, there was a green room in the direction of the clock, where guests close to Balfour’s sometimes stayed. Next lady’s writing room, which was yellowish, and then in the corner room – the master’s bedroom. Behind the small staircase, the next corner room served as a pantry, but the billboard was a white dyed dining room with a dark brown, wall-mounted buffet that has survived. From the dining room, you can go into the hall, whose walls were light blue with a tiny golden ornament. In addition to the two round furnaces in the corner niches, as a decorative element, there were two lighting fixtures – ceiling chandeliers. Dark wooden furniture covered with silk in the room. Beside the hall there was a fireplace room in red shades. Unfortunately, the white tile fireplace is eliminated. From the entrance to the fireplace room in the corner room – in the cabinet, dealt within brown shades. Behind the small staircase to the basement was sofa room in golden colours, but beside it there was a flower room, in a special grey pigeon tone. Then followed a dark blue room of cards, from which the door again brought out the residential buildings in the lobby. 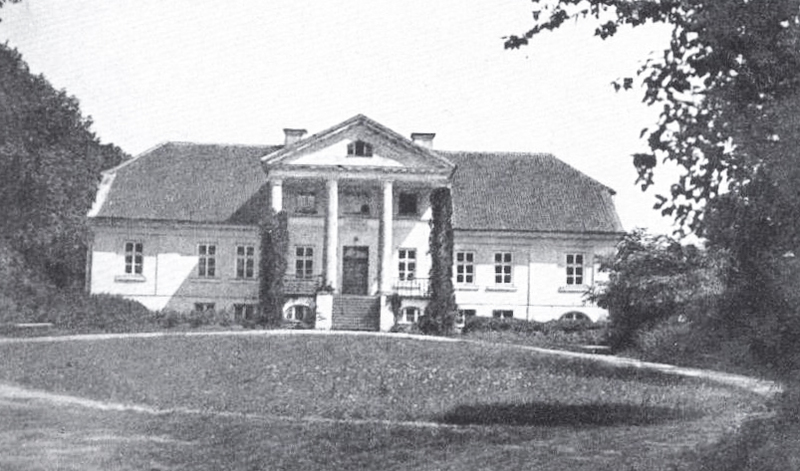 In the third – the upper floor was usually inhabited by guests. Next to the building is a 2-hectare park and an orchard.